The Support Team handles technical issues and inquiries. You can view your open cases at any time by logging into the Support portal! First you’ll need to set up a login by visiting the signup page here and entering your information. Once you submit the form, a verification email will be sent to you. Click the link in the email to set your password. Visit the portal at sailthru.zendesk.com and click Sign In. Under the Client Support menu, click Check Existing Tickets. You will see a list of Support cases (at this URL). To filter by case status, change the parameter in the Status drop-down. By default, users will only see Support cases they have created. 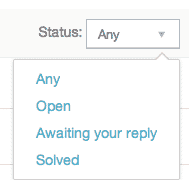 Alternatively, you can be enabled to view Support cases opened by all users across your company. If you would like to activate this, please contact Support! Inquiries may be submitted to Support via the portal, by email or phone. In the subject line, please include a descriptive one-line summary of product area and issue. If you are forwarding an email, please edit the subject line for clarity and preface the message with a detailed description of the issue. Specify the issue priority so that we can understand your business needs. Relevant names or IDs of system objects, e.g. campaign ID, template name, etc. Relevant URLs, e.g. report links, user profiles, content items, etc. What are you expecting to experience/see?